The gnomon is a massive "T" weldment of 1/2-inch thick stainless steel plates with a similar angled brace supporting the gnomon on the north. The stonework mortar and concrete dial face have deteriorated and the dial is now in poor condition. A plan to restore or reconstruct the dial is under study by the college and interested local individuals. There is some doubt about the correctness of the dial design or construction layout as some of the hour lines seem slightly misplaced. 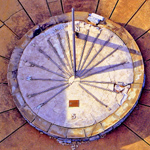 The gnomon root appears to be shifted several inches north but this apparent shift may be due to "crowning" of the dial face to provide water runoff.